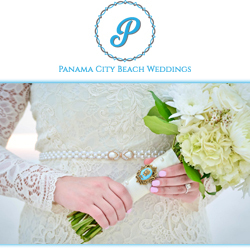 Panama City Beach Weddings is a boutique style beach wedding company specializing in intimate beach ceremonies. With the Gulf of Mexico as the backdrop, our focus is providing you the perfect beach wedding. With almost 20 years in the beach wedding business, Panama City Beach Weddings has the ability to create the perfect beach wedding experience! When selecting your wedding package consider the 3 most important components of your special day! In each wedding package you will receive a full print release, advanced editing, online photo gallery, and full resolution digital downloads of your images. No other beach wedding company offers the commitment and care we give to our photography service. We provide upscale, shabby chic, boutique style wedding packages. We offer many custom made floral designs, varied styles of bridal arches, aisle way selections coordinating with your floral design and coordinating kissing balls on shepherd hooks to accent your choice of bridal arbor. The coordination of the details is a major component of your special day. Everything will be waiting for you when you arrive- just walk down to the beach and say “I do.” Booking your officiant, selecting the beach location, music, setting up your decor, coordinating the ceremony, conducting the photo session during and after the ceremony, and referrals- all are included with your package.